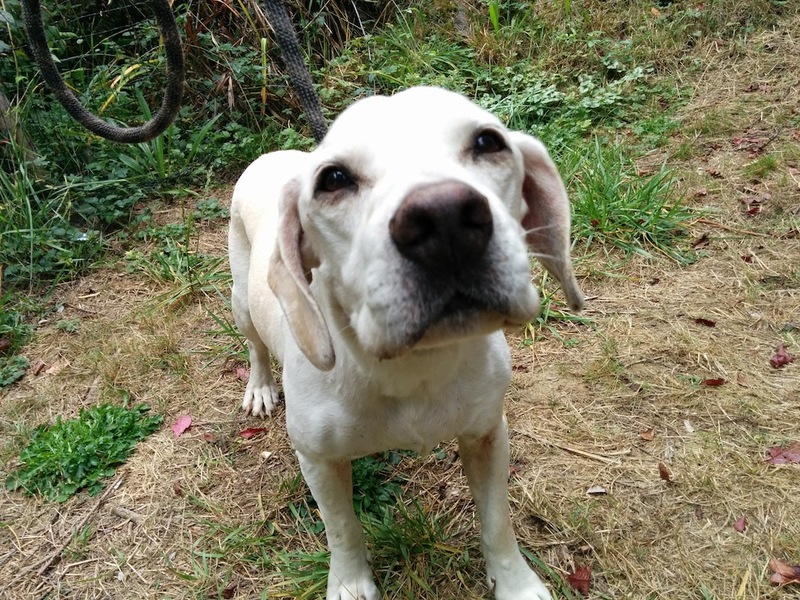 Willow and I were camping in a Humboldt Forest in October when out of the morning fog walked an old, friendly lab. Willow immediately went to great the new arrival and they got along well. We could tell he was a bit hungry, thirsty and cold so I gave him a couple of doggie biscuits and he helped himself to water from Willow’s bowl. He had no collar and had a couple of what we thought were sizable sebaceous cysts so we hoped that someone had not dumped him to save on vet bills for the old fella. 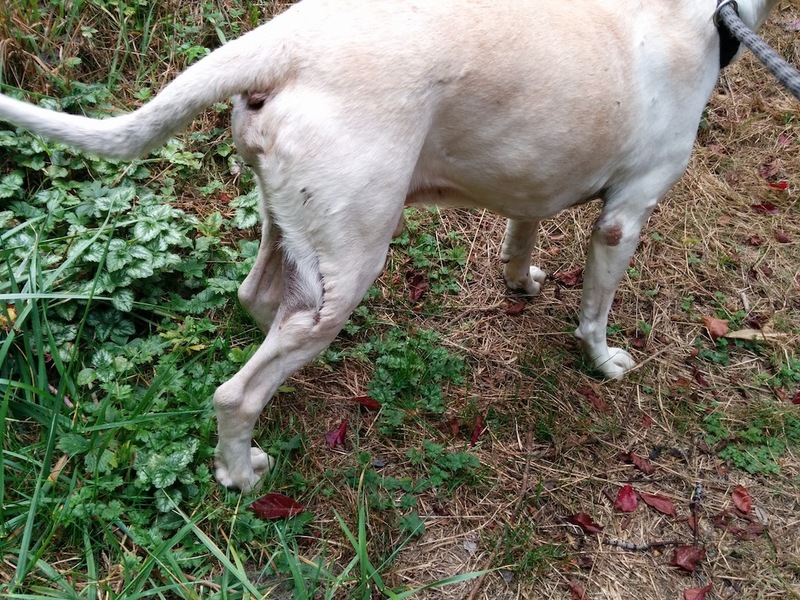 We then saw what looked to be the scar from an ACL repair surgery or something in that area which is a bit pricey so we hoped that meant someone loved him enough to give him a second chance at an active life and would be missing him. 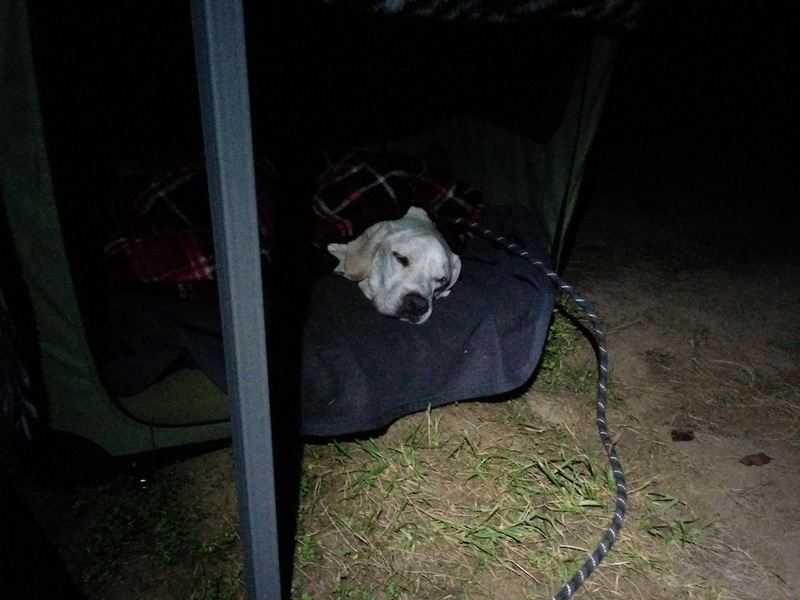 It was getting late and we didn’t have time to get him into a vet in town to check to see if he was microchipped so we gave him more food and water and he and Willow romped about the campsite for an hour or so before he got tired and we began the setup for him to stay with us for the night. Hooked him up to a cable and Willow’s Ruffwear Just-A-Cinch leash and directed him into Willow’s soft-sided fold down crate, covered him up with one of Willow’s blankets and he immediately went to sleep and slept like a log for the rest of the night. The next morning we all woke up about the same time. I made my coffee and fed both dogs. I gave him a small breakfast because I didn’t want to upset his stomach too badly with different food than what he is use to but he ate enthusiastically and pooped normally on our post-breakfast walk. We loaded up in the Tacoma and went down the mountain to a friend’s house to use his computer to make a Found Dog sign to put up at the local market and maybe a few telephone poles. Then we were going to go into the main town to a Veterinary Office and see if he was microchipped. Luckily, as soon as I walked into the store and asked to put up the sign I was told that the owners had just been in there asking about him and had left their number. 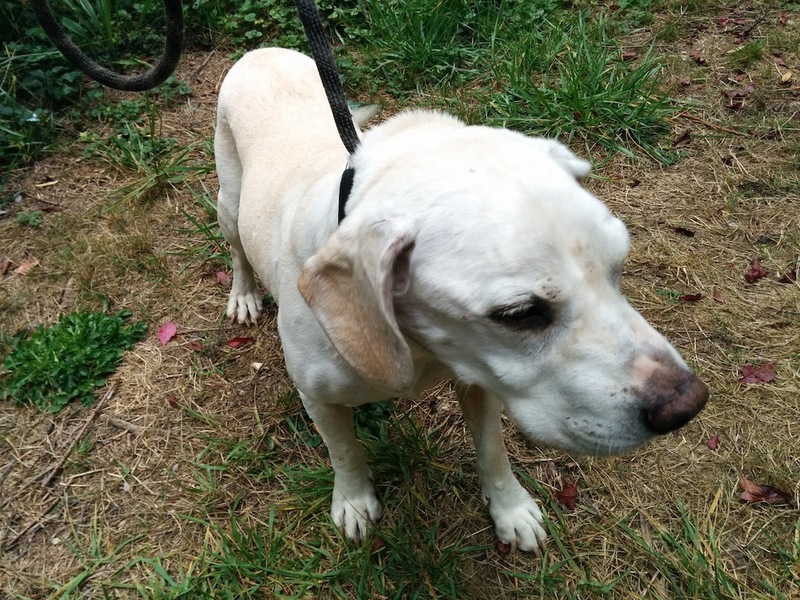 One quick phone call and 10 minutes later two teary-eyed humans came to reclaim the old man and that’s when we found out his name was Bud and he was 15! We also found out that he was the woman’s father’s dog and her dad had just died about a month ago. They had been back to his house in Sacramento the day before doing estate type stuff and Bud had pushed through a small opening in their not-yet-dog-proofed fence and went on a walk-about until he found us. We were told Bud also has a microchip so if things hadn’t worked out so well we still would have gotten him home, just several hours later. Willow jumped down from the Tacoma and the two pups said their goodbyes and we have had another successful Roadside Rescue or, in this case a Nowhere Near a Roadside Rescue.